Laura's doll in desperate need of repair. 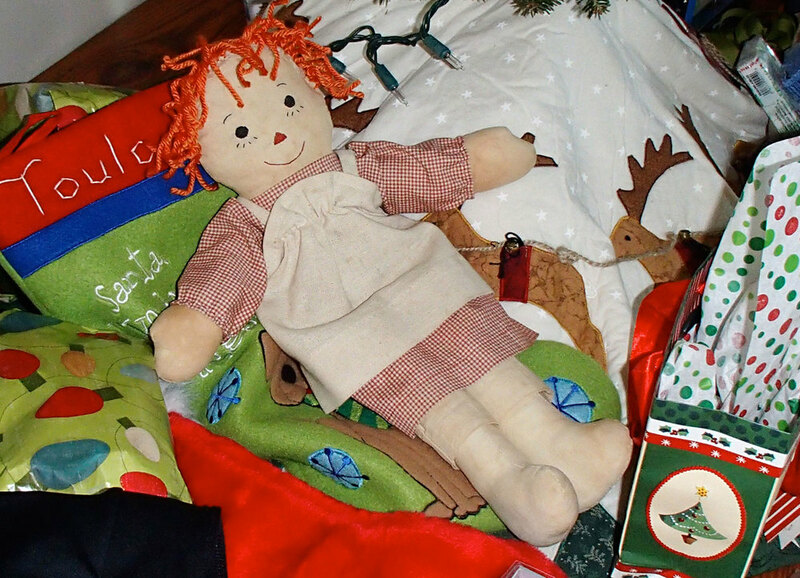 Back in September, I posted a story about a "raggedy" Raggedy Ann doll belonging to my daughter, Laura. She had been waiting four years for her beloved friend to be fixed. Memories and the magic of making something hold a special place in my heart, especially during the holiday season. So when the weather turned cold, I set about in my sewing room to create a makeshift doll hospital. Ann was going to need new insides, grafting surgery on her head, a new hairdo and freshly pressed clothes. Fortunately, her cheery facial features were still in tact. I drafted a new pattern for Ann's head, boiled some muslin in tea to make new skin and went shopping for bright orange yarn to sew fresh curls around her face. I fluffed up her old stuffing, put it back inside, carefully joined Ann's new skin to the old, sewed her up and added those new curly locks. A little steam iron to her dress and apron and she was ready to return to NYC. This Christmas I was able to give Laura a very special gift. Opening the box, my daughter's eyes filled with tears. Now that's the joy of making something. Christmas magic under the tree. Back home in Laura's apartment. And now Raggedy Ann is back home with Laura where she belongs. Not on this little white chair, mind you. That was just for the photo op. She's high up on a book shelf, safely out of the dog's reach.